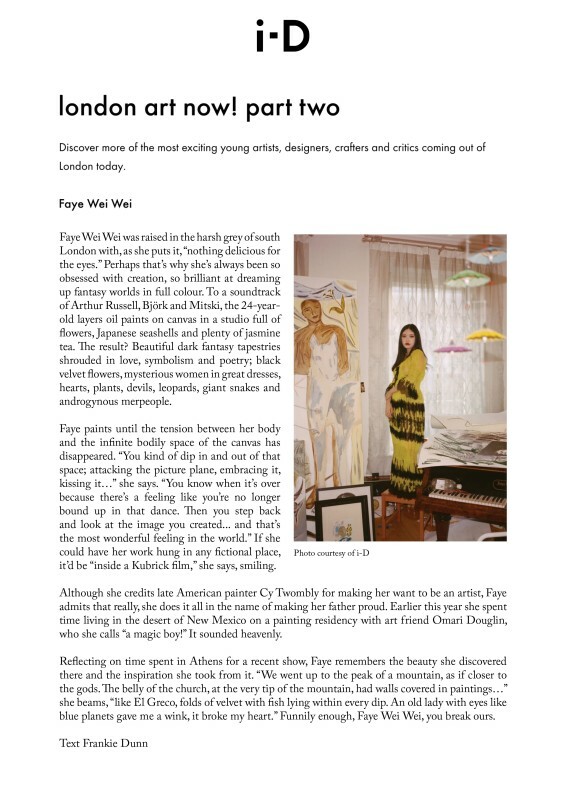 Faye Wei Wei was raised in the harsh grey of south London with, as she puts it, "nothing delicious for the eyes." Perhaps that's why she's always been so obsessed with creation, so brilliant at dreaming up fantasy worlds in full colour. To a soundtrack of Arthur Russell, Björk and Mitski, the 24-year-old layers oil paints on canvas in a studio full of flowers, Japanese seashells and plenty of jasmine tea. The result? Beautiful dark fantasy tapestries shrouded in love, symbolism and poetry; black velvet flowers, mysterious women in great dresses, hearts, plants, devils, leopards, giant snakes and androgynous merpeople. Faye paints until the tension between her body and the infinite bodily space of the canvas has disappeared. "You kind of dip in and out of that space; attacking the picture plane, embracing it, kissing it…" she says. "You know when it's over because there's a feeling like you're no longer bound up in that dance. Then you step back and look at the image you created... and that's the most wonderful feeling in the world." If she could have her work hung in any fictional place, it'd be "inside a Kubrick film," she says, smiling.